Will automatically set your PC clock to the time from GPS receiver connected to the computer. · LGPSTime can be launched as a usual application or quietly in the background. 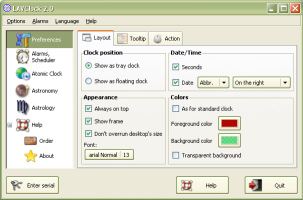 A small icon is placed in the tray bar indicating that LGPSTime is running. An astrological digital clock that extends or replaces the standard Windows clock. The Screen Saver which displays realistic model of the Earth on a background of twinkling stars. You can see rise/set times of Moon and Sun. You can configurate the product as your Screen Saver. The Screen Saver which displays realistic model of the Moon on a background of twinkling stars.